Finally: It's arrived -- Volume 1 of Tom Antonellis - Laugh at or With - The Podcast! You never get a second chance to make a First Impression. Unless you're Tom Antonellis and you've got a podcast AND an album dropping on Star Wars Day, 2018! PLEASE SHARE!!!!! Launched on May 4, 2018 this podcast is assembled from material from Tom's newest album, "Tom Antonellis - First Impressions." -- enjoy this free podcast and get a great feel for the album. If you want more, you can pop over to iTunes or Amazon at your leisure throughout May and pick up your copy of the full album. Star Wars/Muppet fans will enjoy special guest Mike Quinn ("Nein Nunb" of 'Star Wars - Return of the Jedi') as he regales Tom and Sasha with stories from his time working on 'Labyrinth', 'Dark Crystal' and 'Star Wars' and with geek heroes George Lucas, JJ Abrams, Jim Henson, Frank Oz and the Muppeteers of the 80s through to today. Special guest, from Alice Underground, Sasha Travis, rounds out the cast with her unique brand of comedy, gravitas, wit and dulcet tones. 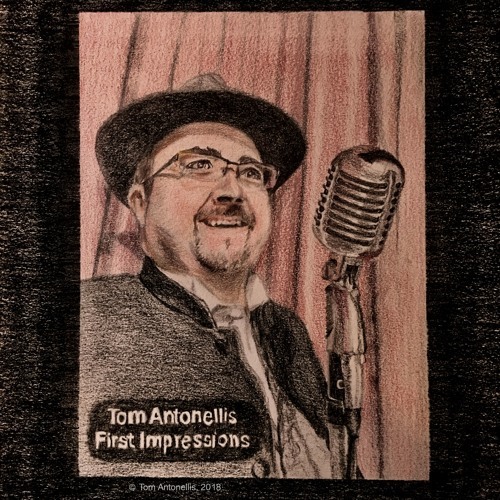 * * * * from the description of "Tom Antonellis - First Impressions": "Enjoy more of Tom's favorite types of comedy: impressions, characters, comedic cover songs, ire-filled rants, 'list comedy' a la George Carlin, and homage impressions to the greats - from Eugene Levy to Anthony Hopkins to David Bowie. Oh yeah: and a Master Class in the Boston Accent. Guest starring Mike Quinn from 'Labyrinth' and 'Star Wars' episodes 6, 7 and 8 and Sasha Travis from the band, Alice Underground. Impressions run in the family too: enjoy guest star Julee Antonellis and listen to original songs from dad: Tommy Antonellis. Enjoy your tour through the artistry of Tom Antonellis experience whether it's your 'first impression' or whether you've known him for years!"